CA190313 – Abandoned Propery Bulk Sale: Slicer, Ice Machine, Stainess Steel Tables, Food Prep. Equipment, Appliances, Tables, Chairs and More. AUCTION CLOSING DATE: Tuesday, April 23rd beginning at 11:07am PDT. REMOVAL: Within 24 hours after auction by appointment. 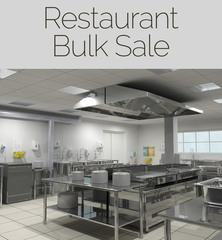 Items to be sold are to include but not limited to: Slicer, Carts, Stainless Tables, Racks, Stainless Inserts, Plastic Bins, Utensils, Scales, Food Prep Equipment, Trash Cans, Pots, Pans, Sheets, Bakers Racks, True Double Door Refer, Ice Machine, Grease Trap, Dining Tables & Chairs, Wall Art, TV’s, True Display Refer, Signage, Ice Dispenser, Drink Dispenser, Shirts, Cash Register, Prep Cooler, 3 Door Refrigerator, Stainless Shelves, 2x Fryers, Hatco Warmer, Single Door True Freezer, Accusteam Griddle w/ stand, Imperial Grill, Side Burner, Surveillance System, File Cabinet, Cleaning Supplies. NO SHIPPING ON THIS AUCTION.